Karl Ernst was only 17 when he was interned, arriving in Knockaloe in late 1914. He was amongst one of the very first batches to be interned there. Each of the internee letters in our collection allow us to highlight so many different aspects of the reality of internment at Knockaloe. Those from Karl to his parents also allow us to understand the thoughts and feelings of a family from Schwalback im Taunus, whose young son is destined to grow into adulthood far away from his home, his family and his friends. The letters below have been kindly translated for us by Mr Jeffers, Head of Boarding, and German teacher at King Williams College (KWC) on the Island. It seems very fitting that Mr Jeffers will be asking his students in Lower Sixth at KWC to take over translating the remainder, as part of his German class. These students are all 16-17, the age Karl was as he entered Knockaloe to start his long imprisonment in an all-male world. I wrote you a letter before Christmas but I don’t know whether you have received it so I am writing to you again. I am interned on the Isle of Man – there are 2000 of us. The Isle of Man is an island in the north-west of England. It’s not too bad here. We get fish, vegetables, potatoes and schäm*, and dessert as well. At Christmas every prisoner received a present: shirts, socks, tobacco, cigarettes and various other items. I received a shirt and packet of cocoa powder. How was your Christmas? What are August, Theo and my sisters doing? Dear parents – if you have done your butchering and have some left over please send me a sausage. Anna could include a few cigarettes as well? I hope you received my first letter so I am going to sign off now. Please say hello to everyone I know. * Schäm literally translated means “shame” which appeared odd in the context of the letter and so we sought help from the 2,000+ followers of our facebook page for assistance in understanding it. Stephan Kräling, living in Germany, explained that it was butter pieces or slices rolled in butter which would be given to help undernourished/underweighted people. Cream would be drunk for the same purpose. People used to eat butter covered in sugar after times of starvation in order to gain weight. The word “schäm” is related to shame as it implies that people who ate “schäm” just for pleasure were classed as gluttons and should feel ashamed. Most internees were reliant upon families for money and extras such as food. In the letter below, Karl has a number of requests, including calendar, perhaps to get a better appreciation of the passage of time in a world where days merged into each other. He also - obviously quite desperately – requested cigarettes. As a younger internee, Karl would have had little opportunity to earn the money himself. As his correspondence progresses, you can see how careful Karl is to document all letters and parcels sent and received. Every single one is subject to the censors of Knockaloe, the most famous of whom was Archibald Knox. "Dear Parents, Your lovely letter of 14th March arrived and many thanks for that. I wrote you a letter on 15th March and told you that I received your parcel. I also asked you to include a calendar for 1915 if you send another parcel. I would urgently request cigarettes! In the letter of 21st February Mother let me know that Emilie had sent me a parcel but I have yet to receive it. In the hope that this letter reaches you the very best wishes to you all. Karl's parents must have treasured letters from Knockaloe, which has ensured the survival of a large number of them today as part of our collection. Sadly we do not have their replies. 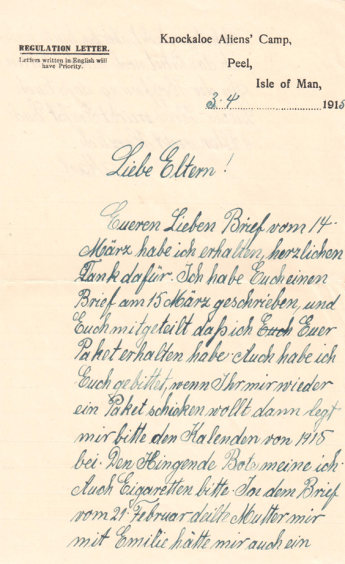 Internees were told that letters written in English would be censored in priority over those in German. All would pass through the office where the censors, including Archibald Knox, carefully checked the contents of every letter and parcel. There was much concern in the letters of so many different internees over the censor retaining and not passing on letters and parcels. His poor parents assumed that his wishes to his Mother for her birthday had got lost - all credit to Karl to confess that he had forgotten her birthday! He really had needed that calendar he requested in his previous letter. I received your lovely letter of the 21st March on the 10th April. The Letter of the 28th March I received on the 15th April. I received your lovely parcel on the 10th April. Everything you described was in the parcel – heartfelt thanks for that. Dear parents – you write you are not allowed to pass on important / urgent messages? As long as there is nothing about the war its OK. Please do that. I really did forget mother’s birthday. Dear parents – I cannot return the box. I gave Mrs Kutsche 35 Schilling. Did she give it to you? You don’t need to write to me in Latin script, you can write to me in German. Mother wrote that Emilie also sent me a parcel but up until now I have not received it. Dear parents – if you want to send me another parcel, then please be so kind as to include a few cigarettes. Please send heartfelt greetings to August Paul and the old Goth. Karl’s mother must have worried about her young son having enough provisions and sent essentials to him regularly. To them he must have very much still been their teenage boy, and it is lovely to note that her March 1915 parcel also included Chocolate Easter bunnies. Where other young men were living life, fighting a war and meeting girls, he must have felt that life was passing him by and here he expresses concern that Emilie might have forgotten him. Despite missing her boy, perhaps his mother remained thankful that he was not in danger of following his “comrades”, and others of his age, onto a WW1 battlefield. I received your lovely letter of the 21st March today on the 16th April – Many thanks for that. I received your second parcel which had cake, lard, ham, sausage, cigarettes and chocolate Easter bunnies – heartfelt thanks once again. I received a letter from Anna but nothing from Emilie. I did however receive a letter from Lina from Hallmenach(?). She has thought about me but Emilie seems to have forgotten about me. Dear parents – you are allowed to include important / urgent messages as long as there is nothing about the war. If you want to send me something else please include the messages. I look forward very much to seeing you all again. Please send my greetings to Marie Presber and my comrades. Original Letters ©The Knockaloe Exhibition and Patrick Visitors Centre and Archive.